The UV-resistant surface treatment on one side of the polycarbonate sheet significantly improves long-term weatherability. Periodic cleaning using proper procedures and compatible cleaners is recommended to prolong the service life. For general cleaning, it is recommended that the following instructions and cleaning agents be used. These procedures and cleaners are also recommended for use on the untreated, interior surface of the polycarbonate sheet, and for acrylic and APET plastics. Rinse polycarbonate sheet with lukewarm water. Wash polycarbonate sheet with a mild soap and lukewarm water. 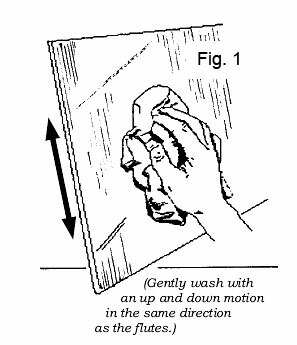 Use a soft cloth or sponge and gently wash with an up and down motion in the same direction as the flutes, as shown in Fig. 1. Rinse the cloth or sponge and change the water often. DO NOT SCRUB or use brushes or squeegees. The coating on polycarbonate sheets is UV-resistant; IT IS NOT A MAR-RESISTANT COATING. Repeat rinse and dry with a soft cloth to prevent water spotting. IMPORTANT: If a material is found to be incompatible in a short-term test, it will usually be found to be incompatible in the field. The converse, however, is not always true. Favorable performance is no guarantee that actual end-use conditions have been duplicated. Therefore, these results should be used as a guide only and the products must be tested under actual end-use conditions by the user. Polycarbonate sheets are treated on one side for protection against UV damage. This treated side must be glazed outward or toward the light source to provide protection for polycarbonate sheet substrate.